As what you do on the first day of the year determines the rest of the year, or so it is said, I was invited to speak on local radio about New Year Day customs – prominent in these is First Footing and I was interested to hear both the newsreader and the presenter recounted their own First footing. First footing is an interesting piece of British folklore and one that is clearly spreading and as it has taking away local variants no doubt. Early accounts record that it was restricted to the north of England and Scotland but clearly has spread in the first place as the 1st of January was accepted in England as the first day of the year and as media has recorded it. 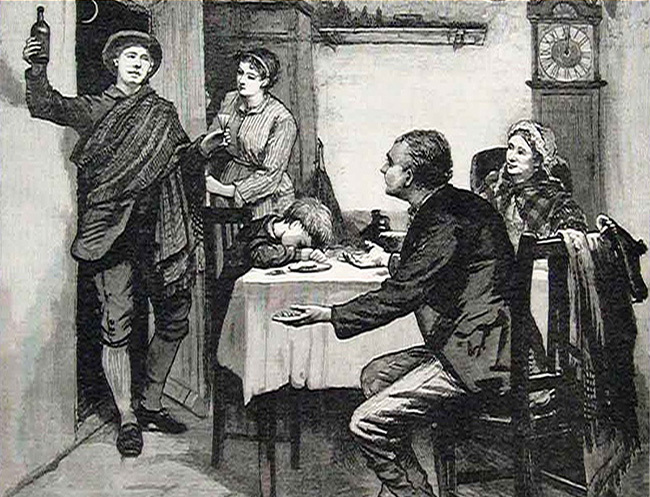 If the person had black hair he or she would be welcome to come in the front door and leave by the back, it was a sign of good luck for the coming year and anyone performing this generous act was awarded sixpence according to custom. “and a big fat goose to last you all year. Well I can record that it is still done as noted in my radio interview. So next year my bread, coal, silver will be sitting on the doorstep ready for the doors to open! 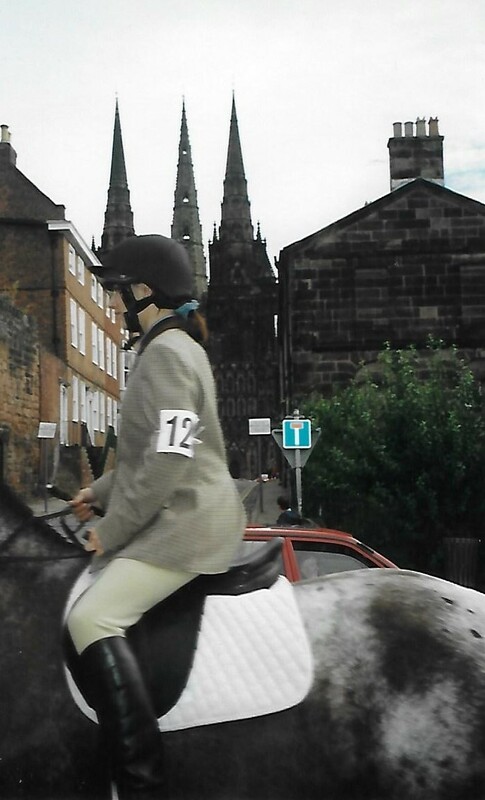 Back in 2001 I was invited to see a strange spectacle which by its rarity and unusual description I honestly didn’t believe actually existed, All Soul’s College Hunting the Mallard. Sadly in the end I could not go and missing out in a way cemented by desire some may say obsession to catalogue our curious and colourful customs. Why? Well because the Hunting of the Mallard is the rarest of beasts, as rare as the said Mallard, as it is only done every 100 years. The location in the dream was next to the church and upon digging where he was directed and could hear in a hole: “horrid strugglinges and flutteringes” reaching in he pulled a duck describe as the size of “a bustarde or an ostridge.” This was a the sign and as the bird flew away the academics who were to become the Fellows of All Souls chased it, caught and then of course ate it! And so immortalised the bird in the college’s history. It may have been thoughts like this which resulted it in being a 100 year cycle! On the night of January 14, 2001, some of Oxford’s most learned fellows could be seen marching around All Souls College behind a wooden duck held aloft on a pole. They were engaged in the bizarre ritual of hunting the mallard that occurs once every 100 years at the College. I was up at Oxford at the time, and one of my tutors was present and so I got the eye-witness account of the matter. 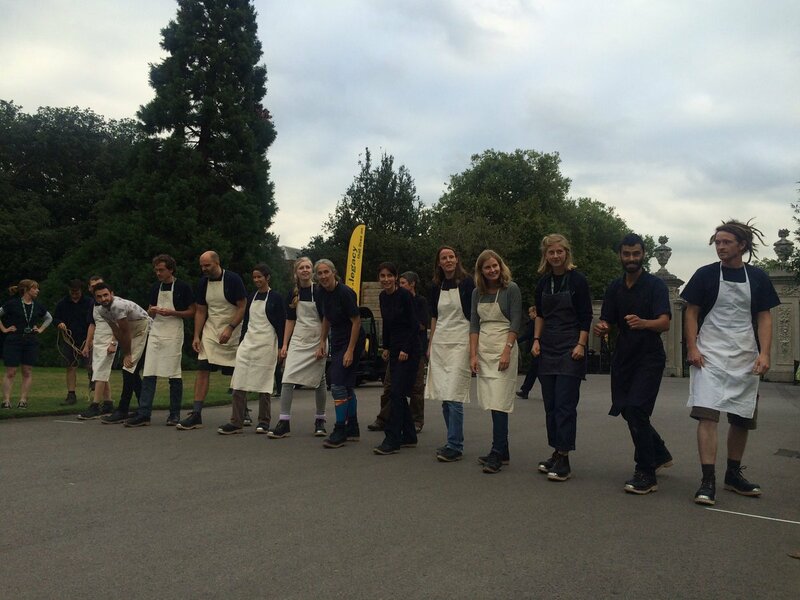 After a commemorative feast the fellows paraded around the College with flaming torches, singing the Mallard Song and led by “Lord Mallard” carried in a sedan chair. They were in search of a legendary mallard that supposedly flew out of the foundations of the college when it was being built. And so, during the hunt the Lord Mallard is preceded by a man bearing a pole to which a mallard is tied. Originally it was a live bird, by 1901 it had become a dead bird, and by 2001 it was a bird carved from wood. The last mallard ceremony was in 2001 and the next will be held in 2101. “some of the junior fellows could not be restrained from eating portions of its charred flesh”. But lett All Souls’ Men have ye Mallard. It was a swapping, swapping mallard! That happen’d in ye Reignes of theire Kings. But lett them prove it if they can. Hee was a swapping, swapping mallard. Oute swapped all ye wingged Nation. Let’s dabble, dive & duck in Boule. The song is not restricted to the Mallard and is song at events such as the Gaudy held annually. Sad to have missed it and not a single photo…ah well here’s to 2101!! Despite the pleas Dumferline chose January 1st and Handsel was consigned to history. Now there is a reason to revive a custom! It is a fairly nondescript lane, and dare I say it in a non-descript part of Yorkshire, and driving by one might wonder why so many cars were parked on the verge…but the eye alights on a group of people awaiting at the edge of a small woodland just beside the road. Cars and woods? Is this a mass dog walking exercise or ramble? No the crowd await something quite magical – Lord Conyer’s Morris Men’s rendition of the fabled Abbot’s Bromley Horn Dance. “At the beginning of the twentieth century at Todwick in South Yorkshire, an ancient oak known as the Trysting Tree blew down in a gale. This tree was connected to the legend of Robin Hood and is mentioned in Sir Walter Scott’s classic novel ‘Ivanhoe’. The Duke of Leeds decided to replace the stricken tree, both to mark the turn of the century and to celebrate the birth of his son and heir, the Marquis of Carmarthen, and on the 3rd October 1901 he planted a sapling grown from an acorn which had fallen from the Major Oak in Sherwood Forest, Nottinghamshire. The day was declared a holiday and all the people from the Duke’s estate were invited to the ceremony. A sit-down meal was provided for the guests in a large marquee and in return the villagers then presented the Duke with a silver rose bowl to mark the birth of his son. And there it stood, at the edge of Bluebell Wood at Kiveton Hall Farm, until 1973 when the council, in their infinite wisdom, decided to cut down the tree whilst widening the road nearby. Then, a Mr Bishop, who was at that time tenant of Kiveton Hall Farm, planted a third oak complete with iron fence to protect the young sapling; the Trysting Tree was back again. The removal was clearly a controversial subject but one which was the catalyst of a custom. 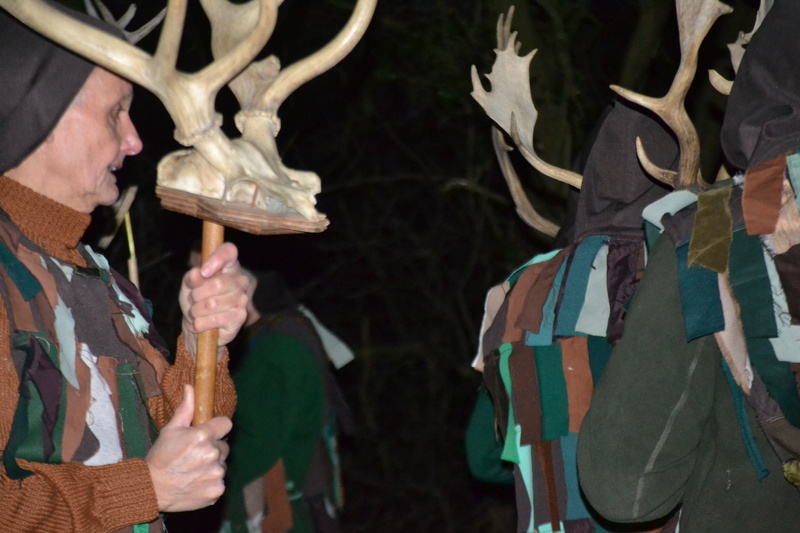 For it has been since 1978 on the last Saturday before Christmas Day the twilight crescendo of a day of carols, sword dancing and Derby Tup – a sort of pick and mix of Christmas calendar customs of the North one could say. The Lord Conyer’s Abbot Bromley Horn dance is one of two imitations and there is no doubt to my mind this is the most evocative; more so perhaps than the real one! I had read of the custom but in a way had thought as I had been to the real one why see the imitations but I feel I was wrong so last year I decided to organise myself and go along and see. The performers maintain the mystery by preparing and dressing out of sight. The first we experience is that weird sound which moves like the mist slowly enveloping the crowd. There’s an unworldly menace to the dancers who weave in and out holding their antlers aloft from a far. They appear to be stuck in the distance the full moon picking off their antlers and firms. 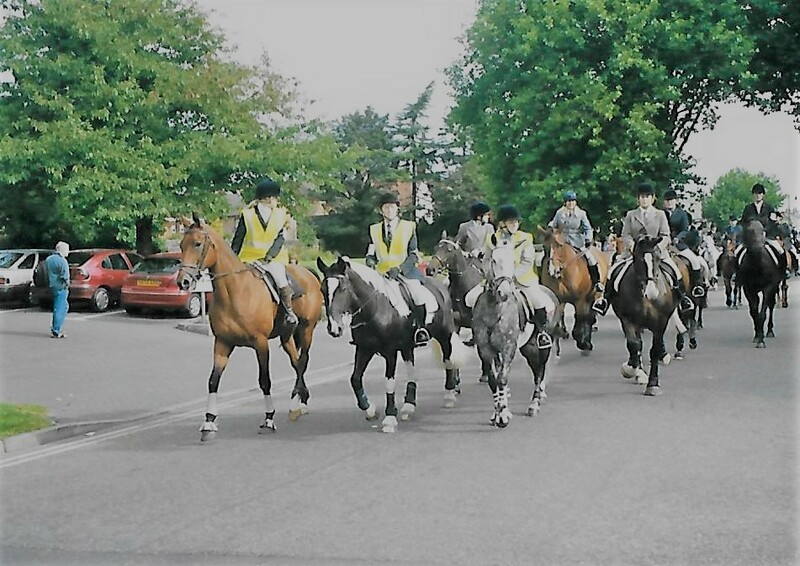 As they came closer one could start to see the group’s form. 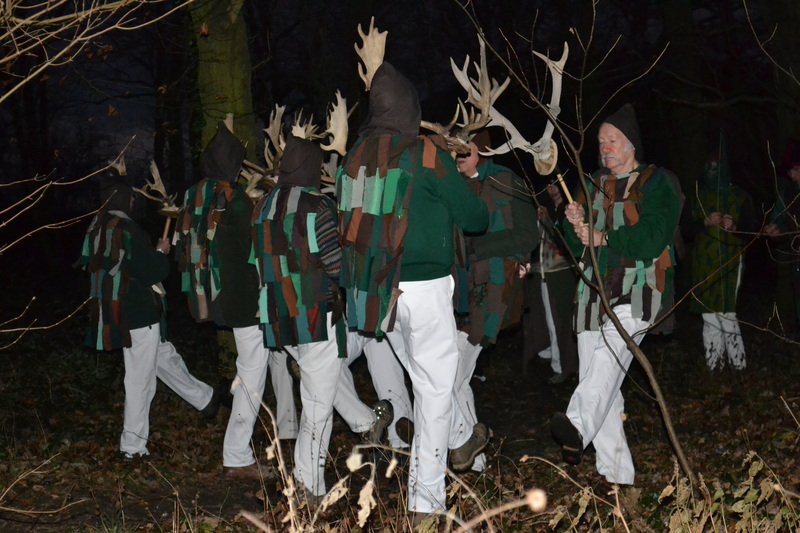 The team comprise of six men carrying large red deer antlers with others bearing smaller fallow deer antlers. Together with these is a fool, a hobby horse, Maid Marian and a bowman – presumably Robin Hood. The last to be seen as they move down a path between the dense undergrowth despite them first to be heard. All in all they appear to be completely different to the Morris men I had seen earlier doing their sword dancing. All in all a great re-enactment and one which deserves notice in folklore calendars. A copy it may be, but one which has developed its own mythos, for atmosphere it cannot be beaten! I get the feeling that Llansteffan is a bit of a little known treasure – a quintissential slice of Welsh, a village dominated by a mighty castle, boasts a secretive ancient holy well with itself having its own ritual, a lovely slice of sand and perhaps the less known a mock mayor. With this in mind I felt rather daunted attending this custom. 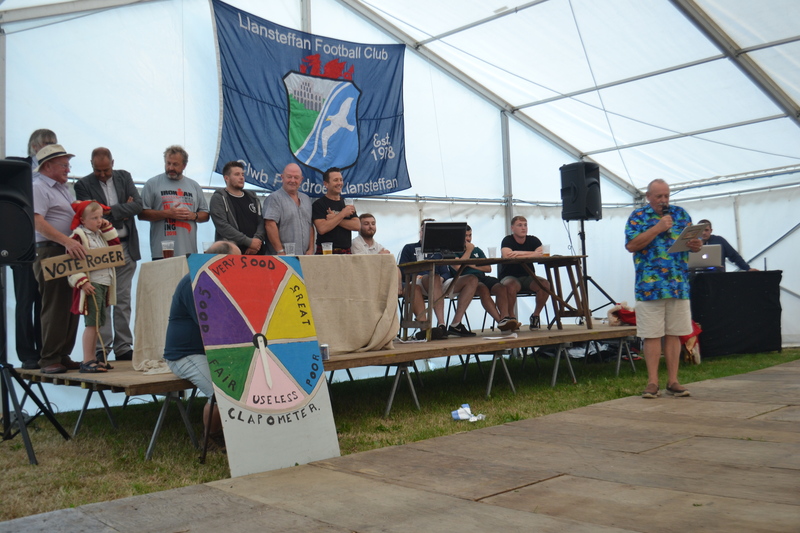 It certainly was a popular one held in a large marquee on the cricket field – more of later – everyone in the village appeared to be there! My first thought was would I understand it. Now in this case this did not just mean would I get the references but was it in Welsh!? 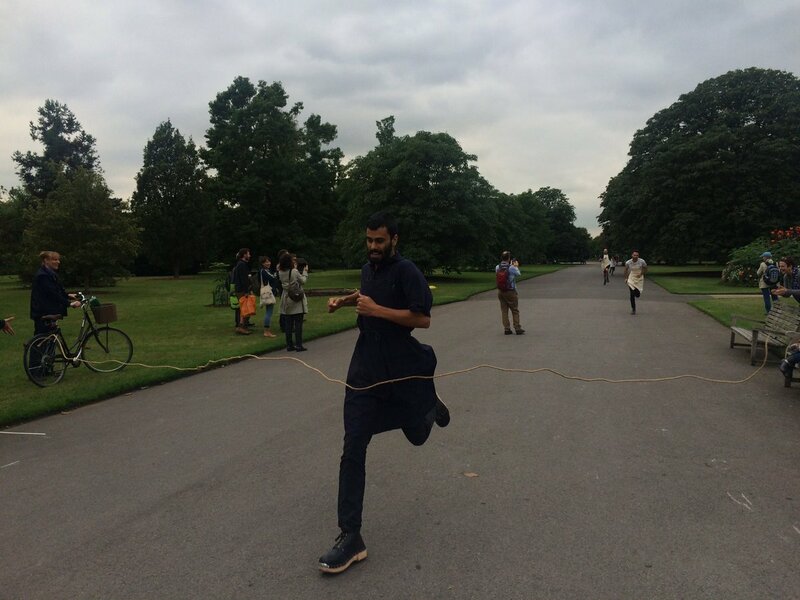 Said to start at 7 – it didn’t – the organiser spoke – in English. First hurdle passed. Now would I understand the references? Yet others have claimed it goes back to King John in the 13th Century. This is not unlikely because Llansteffan’s status as a borough was confirmed by King John in 1200 meaning two fairs a year could be held, Ffair Fawr and Ffair Fach. However, that may have resulted in the position of the Mayor, it does not explain the mock part! 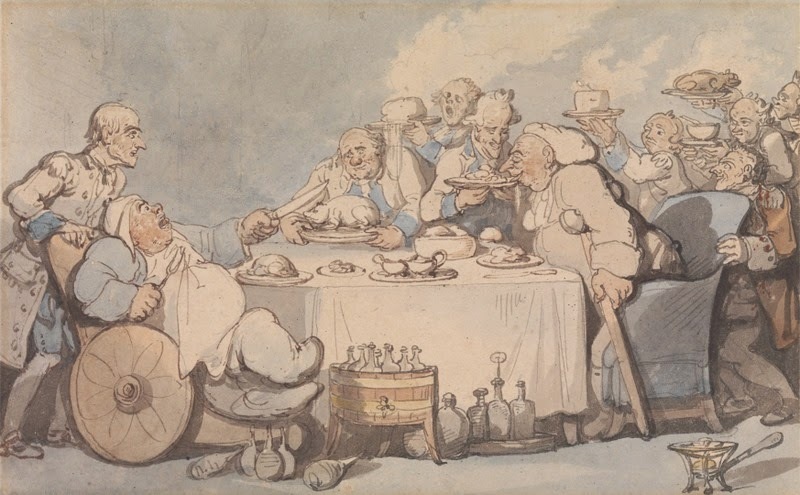 It is recorded that the village tenants would meet regularly to give taxes to the local landowners and that this evolved into a social occasion relieving the effort of paying tax, those congregating would elect one of their member as a Mock Mayor and would then parade him around on a cart perhaps to make a mockery of their landowners! 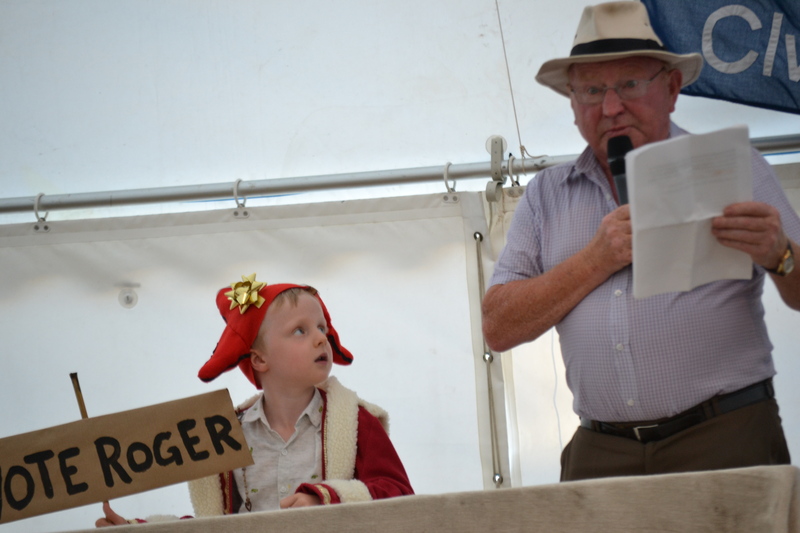 To begin with the crowd warmly welcomed the current Mock Mayor Roger Penycoed , he was accompanied by a mini Mock Mayor, his grandson. Both wore bright red and white fur lined and gold ribbon robes with tricorn hats resembling old medieval mayoral garments. Then the County counselor was called on stage who then went to ceremonially disrobe him so that the election could begin. Then the hustings begun. Of course recent international politics meant there was a rich harvest to parody. It was evident that this was an event which allowed local characters and show people to entertain the group, the first up had apparently stood four times before (and lost) and styled himself Lord Cutglass. Amongst his many election pledges he suggested bringing back the Court Leet from the 13th century. where only men over 30 with an acre of land could vote, boos could be heard – no women county councilors- a dig at their current councilor. However his main thrust was the ‘corruption’ of the current Mock Mayor and his balcony to cries of ‘drain the swamp’ stolen from the Trump presidential campaign. The Ferry was a particular sore point, claiming that it allowed those from St Ishmaels and Landyfaelog to ravage our women, steal our cockles and talk with a Landyfaelog accent! It a direct parody of the ongoing EU Brexit situation. A suggestion of a wall between Llansteffan and nearby Llanbryn again neatly parodying recent political events. But he said the village need not worry as he had made trade agreements with the King of Lundy for pickled It was all in jest but one could see that the ferry was a bit of a sore point! At this point a swingometer was brought on and demonstrated. Was this the way it was decided? The final contestant again two entered to the jangling sounds of Turning Japanese in came the next candidates, The Japanese unified globe party; or JUGS, (!Insert joke there!) 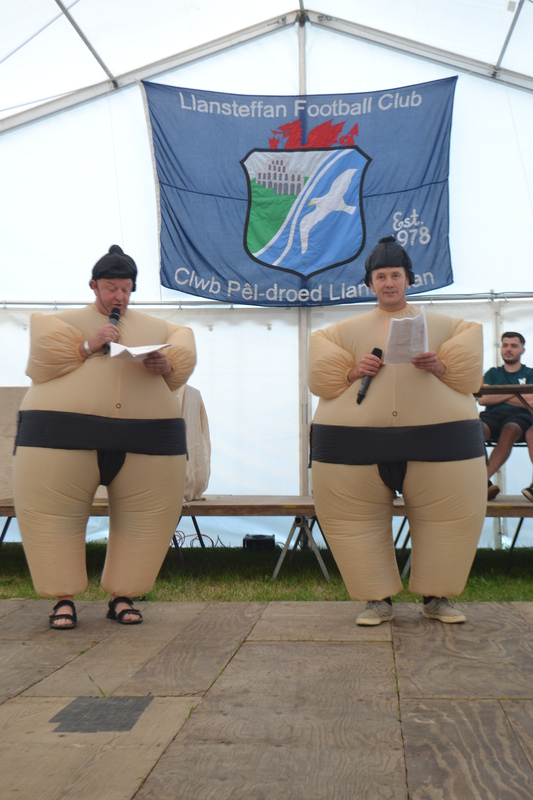 two locals dressed as Sumo Wrestlers, excusing their Welsh accents for being educated in a local college. They aimed to bring Macron, May and Merkle over for an economic summit in the village but despite their combined economic powers they could not book the village hall. They mentioned Hollywood coming Dame Judy Dench and Eddie Izard, but the big surprise they were allowed to park outside someone’s house. They claimed that two big Hollywood stars file for bankruptcy after buying around in a local pub! Which received cheers and claps from the audience as a clear response of some gentrification of their local for the tourist no doubt! It is stated that the influx of tourists gave the Mock Mayor tradition a new lease of life being a popular event for the holiday makers coinciding with Miners Fortnight a holiday for Rhondda miners. 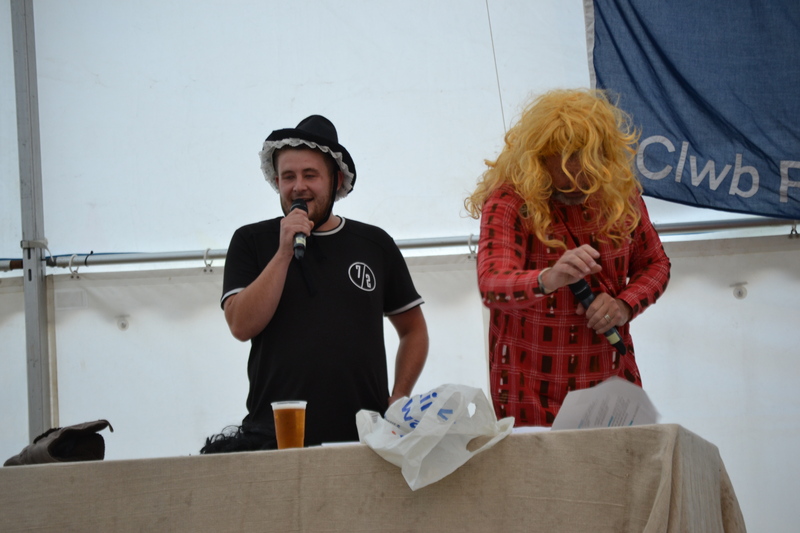 This resulted in anyone being able to stand as the Mock Mayor and as such many holidays were crowned! Canvassing became important and candidates even had agents. The election followed national trends when in 1916 women were allowed to vote and women could become mock mayors. One of the most notable being in 1954 a Madam Lloyd George, no relation! In those days it was held close to y Gegin Fach were there are remains of a stage used for elections. During the early part of the 20th century the summer season encouraged by a local Carmarthen to Llansteffan bus meant that the custom remained as popular as ever. A notable Mock Mayor, top hatted wearing W.H. ‘Bonny’ Lewis, his election promise included a daily air service from Llanstephan to Llansaint and another for `a huge Observatory to be erected on the Castle Grounds to publish weather conditions for farmers and shoemakers. As such he was voted Mock Mayor in 1932 and 1953. Another `Paddy’ Trench suggested that mermaids could be employed in the bay to attract bachelors and gold plate all cockles raising their value. Such characters created great pre-election crowds to hear them speak. 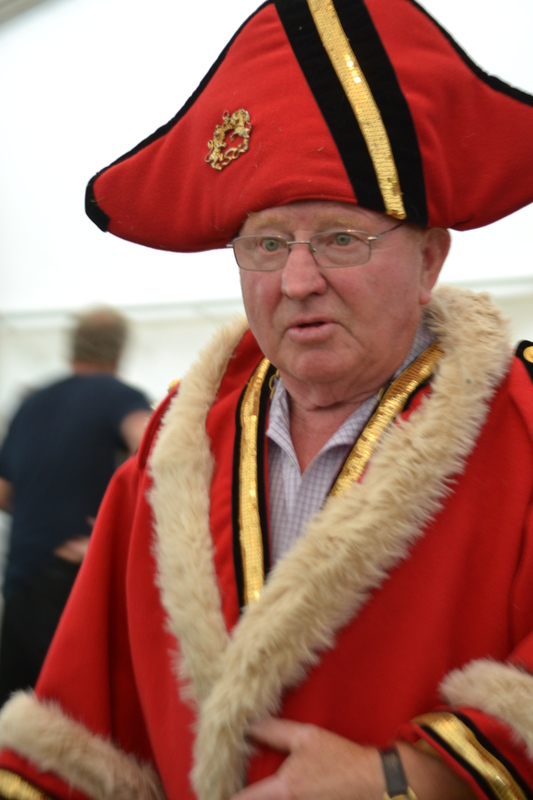 Despite the considerable popularity of the Mock Mayor ceremony times were changing. Tastes were changing. Holiday tastes were changing. The 60s and 70s saw the custom nearly completely disappear but it did not completely die out and was revived thanks to the Llansteffan Football Club who continue to organise it. The tourist numbers had perhaps fallen, attracted to the exotic beaches of the Med not doubt but this did mean that the Mock Mayors would return to local people. A custom like this lives or dies with both the enthusiasm of those involved and the ‘characters’ involved. The 80s saw these characters return and even the TV when to coincide with the 1987 General Election local character Des Cridland was to be unseated by the so called Morality candidate Peter Jones, only to have him disgraced by the appearance of a pregnant women who claimed Jones was the father. The TV cameras distilled all these dirty tricks and outrageous electoral pledges which may have been not far off from what was really going on at Westminster! The TV attracted more interest and clearly pride in their unique custom and since then the custom has been in very rude health. From the laughter cheers and effort made by the unsuccessful candidates it does not appear in any danger of disappearing! After the new candidates spoke it was time for the present incumbent to speak accompanied by his robed grandson with a placard vote Roger. With much lose he gave an impressive if slightly Bacchus sponsored one drawing on some more serious points peppered by the grandson chanting vote Roger. It was clear that there was warmth for him from the congregation and it soon became evident that this was more pantomime than politics. 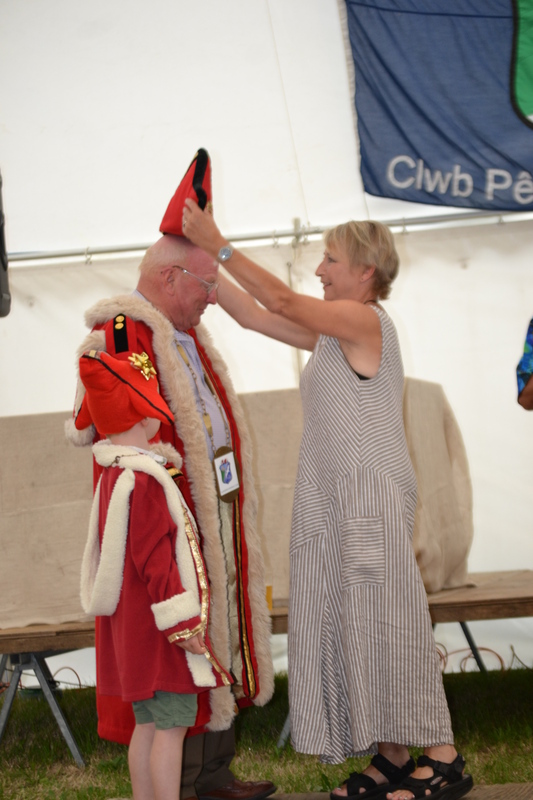 Llansteffan Mock Mayor’s ceremony is something I believe many communities need a lighthearted irreverent knock about where local people can identify what really annoys them in a typically British way. It is evident the lack of Cricket, empty houses in the town and the cost of drinks in a local pub are matters that do matter and so in typically British way comedy is used to identify them.